I feel like I’ve made a lot of steak tacos lately. Which is weird since it’s usually chicken that I feel like I make more often than anything else. But hey, you don’t mind, right? Especially since they are scrum-didly-umptious! As if I would share anything less! Things have been a little crazy around our house lately, schedule-wise. This past weekend we went to J’s family reunion and had a great time. Then the next day, one of my besties and her family came over for dinner. We had a great time, but my timing was a little off and dinner took longer than I anticipated so we spent more time standing in the kitchen than catching up. Boo. I’ve also started working a little part-time job about three nights a week and I don’t get home from that until around 10 o’clock, so I’m having to finagle my cooking schedule to make sure my honey is still fed when I’m not home. I know, I know…I spoil him. But I love him and don’t want him eating crap take-out because I’m not there. So, some nights I pull double-duty and cook two meals at once. That’s where my usual quick meals come in very handy! I can spend 30-45 minutes in the kitchen and have two meals done. That’s a purdy good deal, don’t ya think?? Now, generally I don’t post multiple pics or pics that include the various stages of cooking a meal, but I decided that I would. Just to change things up a bit. I mean, sometimes it’s interesting to see what the components look like before they’re all thrown together, right?? 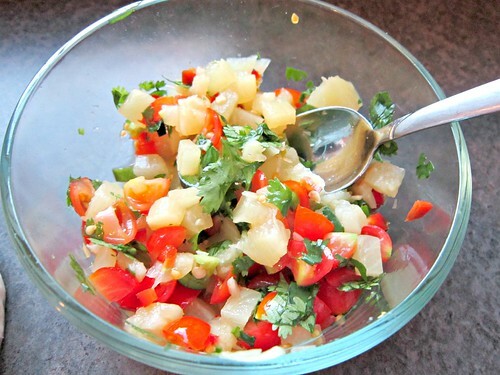 Juicy steak smothered in ginger and garlic…pineapple salsa all pretty in a bowl. Oh! 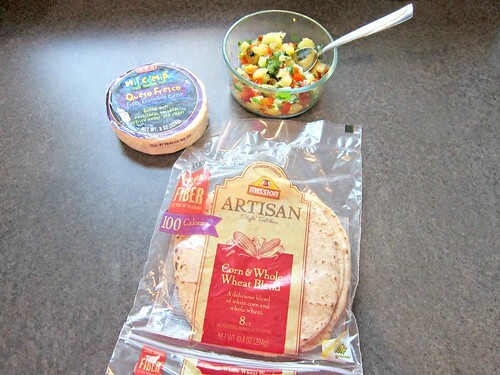 And the corn& whole wheat blend tortillas that I’m always telling y’all that I use. I know you’ve been just dying to know what those are. Right?? Well now it’s a secret no more. Although now that I think about it, I may have posted a photo previously. Oh well…a little reminder never hurts!! I’m going to get really brave this week though, and try to make my own. Wish me luck!! And now, about those tacos!! 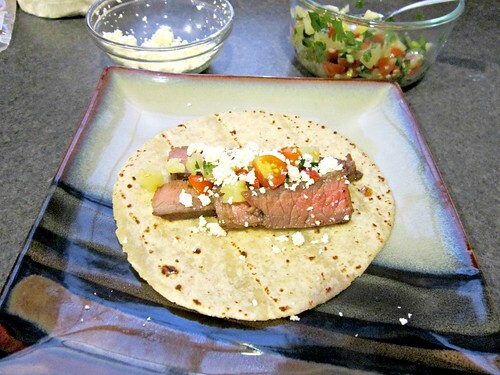 I’ve already told you all how I really love using sirloin steaks for tacos and such, so that was no disappointment. I love, love, love Worcestershire sauce so I was already excited about the marinade and I was right to be. It made the meat taste fantastic! I used a green and a red jalapeno from our garden for the salsa and holy hotness! I think it was the red one, and it was a spicy one! I’ll admit, I was a little hesitant about the pineapple. But I’ve made mango salsa before and I figured it was along the same lines of fruit salsa, so why not?!? I may have eaten more of the pineapple by itself before I cut it up than I actually put in the salsa…but there was plenty there and it went great with the steak! Season the steak with the salt and pepper and place in a large resealable plastic bag or a shallow baking dish. In a medium bowl, combine the olive oil, soy sauce, Worcestershire sauce, garlic and ginger. Whisk well and pour the marinade over the steak. Seal or cover the steak and refrigerate for at least 2 hours, or overnight if possible to really soak up those flavors! When you’re ready to cook the steak, Preheat your grill or grill pan over medium-high heat. 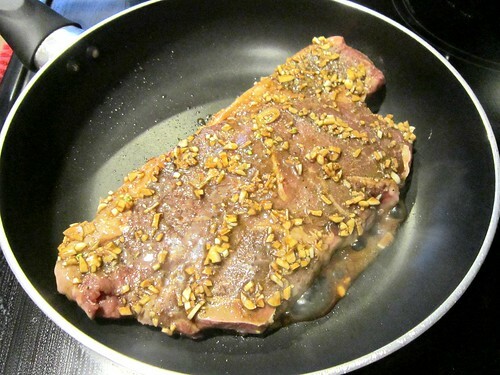 Cook the steak for 4-5 minutes per side, or until it reaches your desired doneness. Remove to a large cutting board and let it rest for 10-15 minutes to really seal those juices in before slicing, against the grain, into 1/2-inch strips. While the steak is cooking (or before that if you’d like), combine the ingredients for the salsa in a medium bowl and set aside until ready to use, so the flavors can meld. 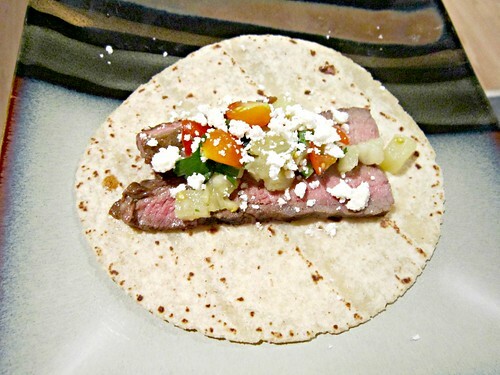 To assemble the tacos, warm your tortillas and top with a few slices of steak, a couple of spoonfuls of the pineapple salsa, and a sprinkle of queso fresco. Love the extra pictures!! I like seeing the stages and different components. Plus, pineapple salsa = yum. Can't wait to read about the homemade tacos/tortillas!